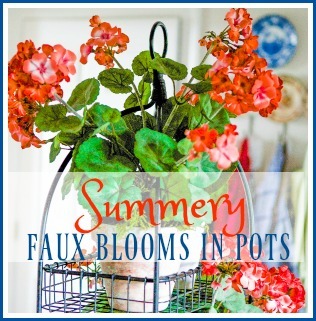 In the summer there is even less time to fuss & fiddle with decor. But everyone can find 10 minutes to transform a space. This is why I look forward to our monthly series ~ Ten Minute Decorating. That is really all the time you need when you follow our tips. Plants & flowers are our focus this month. I used two $5.99 plants from the grocery store to liven up a space in my kitchen. We are just getting to the point in the restoration of our home to start decorating & styling. Yippee!!! I chose to begin with an out of the way nook in the kitchen. This space was to have custom cabinets like the rest of the kitchen, but then I realized this thrift store hutch would fit perfectly. ~ and what a savings too! I think the hutch adds just the right “un-kitcheny” feel to the space and breaks up all the white, while tying in the distressed pine of the dining room table. Can you tell I am itching to decorate? Let’s get back to the plants! I played around with lots of my ironstone and gold & white pieces until I found an arrangement I loved. The green of the moss gave me the idea that plants would do the trick. I found an ivy & a fern in the grocery store. Indeed I think the plants do the trick. 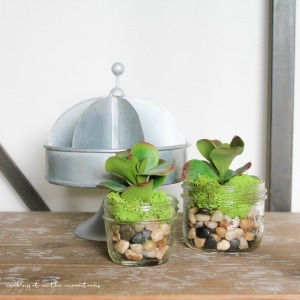 They add a pop, carry the green of the moss balls thru the space and soften the whole look. Repot into a larger container adding some potting soil. If using a pot without drainage holes place small pebbles in the bottom for drainage. Use my three secrets when re-potting or general liquid indoor plant food 1x a month. If pot is on a wooden surface elevate it a bit with a saucer or at least folded paper towels to avoid leaving moisture rings. Check soil a few times a week for dryness – if the top portion of your index finger comes out feeling dry water. 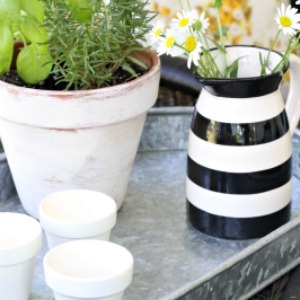 Move pot to the sink to water deeply & spritz lightly with the sprayer or a spray bottle to mist the leaves. Leave pot in the sink for a while to drain before putting back on your nice furniture. If you are vacationing for a week or two you can place pots with drainage holes in the sink filled with a few inches of water. Water well before you leave & let the plants sit in the few inches of water. The roots will absorb the water as needed while you are gone. Next time you are at the market pick up an inexpensive plant and add a pop to your decor in 10 minutes ~ or less! Your hutch looks beautiful. I love the white ironstone mixed with greenery. I looks perfect. You did a great job, and thanks for the tips on maintaining house plants. I think I might have to purchase a couple the next time I’m at my local grocery store. I hope that you have a wonderful day!!! I love your hutch, it’s so pretty! It’s fits there perfectly!! I am smitten with that hutch! And that it fits so perfectly into your little niche means it was meant to be. Always adore the pops of white and green. 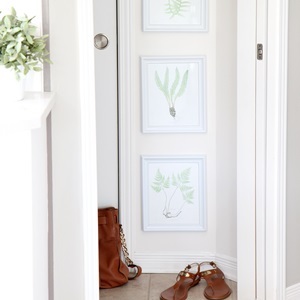 Looks great…I think plants add so much to a room…great color, texture and not to mention healthy too!…I love your hutch…how perfectly it fits in that space! Thanks for sharing these tips! I love the ones about replanting. My plants often die when I try to move them. And these pictures are lovely! That hutch is perfect! You’ve done a great job styling with your wonderful pieces. I love the green pop. 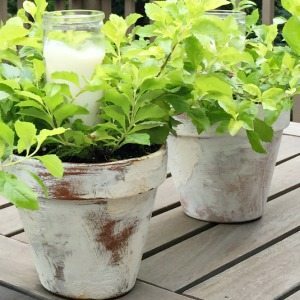 These plants are the perfect touch to your hutch! L-O-V-E!! So quick and easy too to buy them at the grocery store! Pinned! That hutch couldn’t be styled more perfectly! And thanks so much for sharing those great tips! The Hutch is beautiful and your tips on caring for the houseplants are very appreciated! I will be on the lookout for some greenery the next time I am grocery shopping. Thank you Colleen! Glad to have you visit My Soulful Home. Definitely green it up! 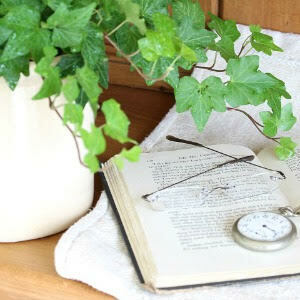 Hi Kelly, thanks for sharing tips on caring for your household plants. 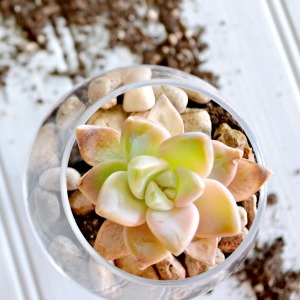 I am into planting succulents right now and trying to find some help on caring for them but I will work on some of your suggestions. By the way, the hutch looks perfect the way it is….great pictures! Hi Kelly, first I just love the podcast and your hutch is beautiful! I didn’t however see in the show notes about the faux olive trees. I have actually been looking for branches, but the ones I have found have olives on them and I’m not so sure I would like that. I think I might be interested in one of the trees that you mentioned. Thanks for sharing!! Hi Samantha, Thank you so much for listening to the Podcast! And thank you regarding my thrifted hutch. I checked with Anita & her olive trees are from Wayfair. When she check the item was out of stock so she didn’t add it to the show notes. However, they will notify you of when it comes it. Here is the link: https://www.wayfair.com/Napa-Home-and-Garden–Napa-Home-and-Garden-Olive-Tree-in-Pot-DI2019-DI2019-L3717-K~NHG4342.html?csnpt=SS49-NHG4342&SSAID=687298&refid=SS687298&df=1 I will email you with it too!